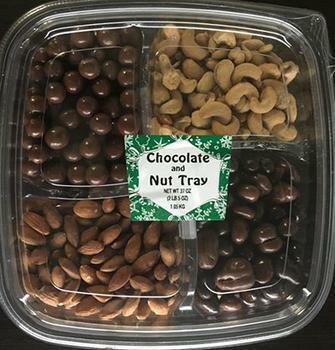 First Source of Tonawanda, N.Y., is recalling Chocolate and Nut Trays containing pecans and cashews, allergens not declared on the label. No illnesses or allergic reactions have been reported to date. The recalled item was sold from November 8 – 20, 2018, in 98 Wegmans Food Markets in Massachusetts, Maryland, New Jersey, New York, Pennsylvania and Virginia. Wegmans will place automated phone calls to notify customers who purchased the product using their Shoppers Club Card of the recall. Customers who purchased the recalled product may return it to the Wegmans customer service desk for a refund. Consumers with questions may contact First Source at (716) 389-0264, Monday through Friday, from 8 a.m. to 5 p.m. (EST).